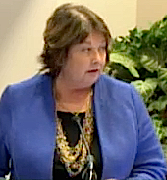 “We are certainly at the peak of the high season!” is how Virginia Haley, president of Visit Sarasota County, put it in a March 14 email to the Sarasota County Commission. As evidence of that, Haley reported that January saw a 5.2-percent increase in visitors over the same month in 2015. The total number of tourists was 77,100, she wrote, and their direct spending grew by 4.8 percent to $95 million year-over-year. “Hotel occupancy remained unchanged at 75.3% and the average room rate grew by 4.8% to $172.10,” she noted. 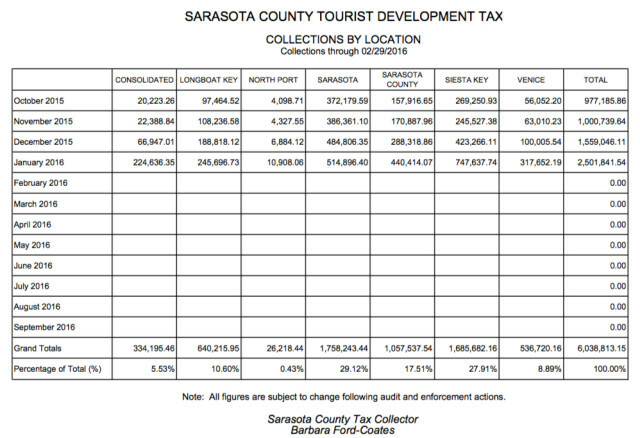 As further evidence of tourism growth, the latest figures compiled by the Sarasota County Tax Collector’s Office show the county’s Tourist Development Tax (TDT) revenue up $79,429.70 from January 2015 to January 2016, with the county having taken in $334,608.89 in TDT funds since the new fiscal year started on Oct. 1, 2015. Those numbers could change, however, as the entities that report TDT collections have to meet a monthly deadline set by the Tax Collector’s Office; staff in that office has explained that some businesses turn in estimates and then report final figures later. Thus far, December has marked the biggest increase in TDT revenue year-over-year, at $182,143.53, the TDT collection data shows. Tourism officials — including Haley — have pointed out that February and March typically are the busiest months for visitors in the county. The location data report the Tax Collector’s Office released shows the City of Sarasota having collected 29.12 percent of all the TDT revenue since Oct. 1, 2015, with Siesta Key in second place at 27.91 percent. In a quarterly report prepared for the county’s Tourist Development Council (TDC), which will hold its next regular meeting on March 17, Visit Sarasota County reported that the percentage of first-time visitors for the first quarter of the 2016 fiscal year was up 27 percent, compared to 30 percent during the same period the previous fiscal year. Nonetheless, for the first three months of FY 2016, direct visitor spending climbed 4.5 percent, compared to the same period in FY 2015, the statistics show. The total for October through December 2015 was $222,233,200. 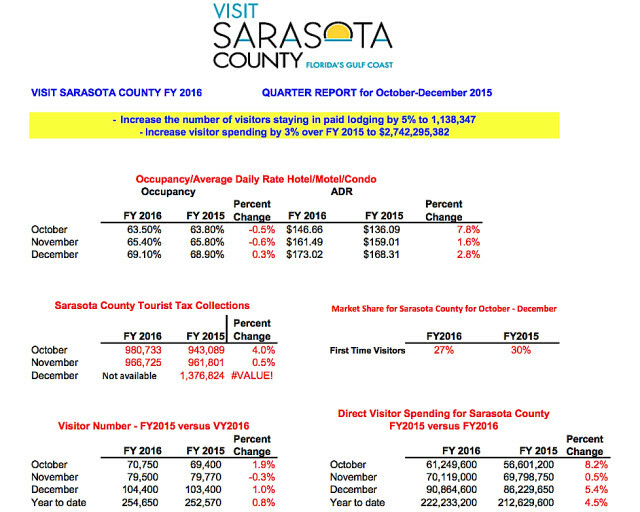 The Visit Sarasota County report also noted that hotel occupancy was up 0.3 percent from December 2014 to December 2015, to 69.1 percent, and the average daily room rate for a hotel/motel or condominium increased by 2.8 percent that month to $173.02. Although the October 2015 room rate increased 7.8 percent — to $146.66 — from the October 2014 figure, occupancy was down 0.5 percent for that month, the statistics show. Occupancy was also lower in November 2015 compared to November 2014, dropping 0.6 percent, but the average room rate was up 1.6 percent, to $161.49. In her March 14 email to the County Commission, Haley also noted a change in plans for celebrating National Tourism Week. That page on the VSC website points out that 21,000 children in the Sarasota County Schools — 50 percent — receive free or reduced-price meals. “When school ends, hunger begins for them,” it adds. Donate non-perishable food items (peanut butter, raisins and canned tuna and chicken, for examples). For more information, visit www.TourismFightsHunger.com.